Which Diamond Blades Should You Purchase? Professional masons, as well as others who work in this field, would agree that using diamond blades make their tasks easier and faster. However, with the advancements in technology and the creation of different models with various features available, selecting the best one can be quite daunting. To help you make a well-informed decision in purchasing, we have come up with this review and guide. Take your time and browse through the details, and be guided accordingly. A diamond saw blade is one that comes with diamonds that are fixed on the edges. They are designed for cutting abrasive or hard materials. In general, they are designed for different types of cutting tasks. As a professional mason, I find diamond blades useful for cutting materials such as granite, marble, asphalt, concrete and much more. It was only until recently that I found the benefits offered by this type of saw blade. Had I known about it before, I could have saved myself from stress after seeing some issues with cutting using traditional saw blades. With diamond saw blades, the cuts are not just precise but are also free from common issues such as chipping and others. The DEWALT DW4701 diamond blade is designed for industrial purposes. It is a general purpose blade, especially designed for dry cutting applications. It comes with a thick edge which is compatible with circular saws, worm drive saws, as well as other portable tools. With the use of an advanced diamond matrix, this blade is capable of offering a longer life, coupled with an enhanced grinder application. It provides consistency in cutting, creating dependable and straight cutting depth, as well as a life span which is 100 times more compared to the standard in the industry. The DEWALT DW4725 diamond blade is designed for high performance. It is built for dry cutting applications, thanks to its continuous rim design. It is also constructed to offer longer life and cutting capacity while enhancing material removal. It also comes with a thinner kerf that increases the cutting speed, while ensuring that dust build-up is minimized, achieving 30 times longer life expectancy compared to bonded abrasives. The QEP 6-1008BW diamond blade is designed as a thin-rim and premium grade blade which creates quick cuts through various types of materials. This Black Widow model is also equipped with features that ensure minimal to zero wobbling or chipping. According to tests conducted by the manufacturer, this blade can outperform other models regarding cutting speed and life expectancy of the blade. As a result, you can enjoy reduced cutting time and faster overall project completion. While conventional saw blades are designed for both professional and beginner users of circular saws, diamond blades are created for those who have advanced knowledge in the trade. These are the types of people who constantly have to deal with cutting tougher and stronger materials, including tile, marble, and others. These diamond blades, technically, do not do the cutting. The cutting action happens when the blades start grinding the materials through friction using its diamond bonding matrix. This is one principle that is considered as basic and should be familiarized by those who opt to choose this type of saw blade. Perhaps you have already noticed that there are different types of diamond blades that are available for selection. Which one are you supposed to get? Diamond blades with segmented rims are those that offers the roughest cuts. As such, they are ideal for use on cutting bricks, concrete, masonry/block, concrete pavers, limestone, as well as hard/reinforced concrete. This type of blade is typically referred to as dry cutting blade. This is because of the cut outs, or the segments, designed on the blade edges. These allow air flow and a cooling effect on the blade core. Blades with a continuous rim are usually referred to as the wet cut blades. This means that water is used when cutting materials. This offers some benefits because water cools the blade down significantly, thus ensuring longer life. Continuous rim diamond blades cut the slowest among different types of blades. As a tradeoff, however, it creates the best cut you can expect. As such, they are ideal for cutting granite, marble, ceramic tile and porcelain tile. Diamond blades that are equipped with a turbo rim are designed especially to cut faster in both dry and wet applications. The rim comes with smaller segments which allow for blade cooling, alongside the use of a diamond matrix for integrated interweaving. The turbo rim allows air to pass through the smaller turbo segments, creating a cooling effect applied on the blade. Because of the design, the blade can cut faster, effectively cutting through bricks, concrete, as well as limestone materials. The ever progressing advancements in technology have resulted in the creation of different types of diamond blades. This is good for most parts, but it can also tend to bog down your capability to make an accurate decision when purchasing. It is very important to know how a diamond blade actually works. This will allow you to select a blade that is equipped with the right features and characteristics to perform cutting tasks. The diamonds that are exposed on the segment surface are the ones that do the cutting, performing an abrasive action in order to slice through different materials while the blade rotates at high speed. It is also very important to know that the hardness level of the matrix is the one that controls how fast a blade can wear off. Therefore, when purchasing, a diamond blade which is used in cutting abrasive and soft materials should come with a hard metal bond in order to ensure that the exposed diamonds are utilized fully before shredding away. To expect optimum blade life and cutting speed, it is very important to match the blade type to the type of material that you are cutting. The features of the material that you have to know includes the aggregate hardness and size, compressive strength as well as the type of sand that is used. If you need to work on various types of concrete materials, it is recommended by manufacturers to select a blade depending on the type of material that you will be working closely the most. Most models of diamond blades are designed to cut a wide range of materials. The decision whether you cut wet or dry highly depends on the requirements of the job, and your personal preference. Wet cutting can reduce the dust, but you may need to deal with the slurry later on. On the other hand, dry cutting will save you from the messy and watery slurry, or the need to equip your saw with tanks of water and hoses. If you are cutting in an indoor environment, a dry cutting blade may prove to be the best choice. 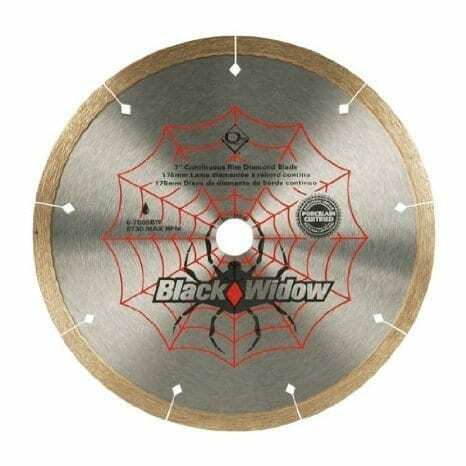 The QEP 6-1008BW Black Widow diamond saw blade is a thin rim, a premium-grade blade which makes cutting through materials such as porcelain, ceramic, granite, marble, travertine, slate, and several others quick and easy. According to the results conducted by the manufacturer, these specialty blades have the capability to outstand competition when it comes to durability, as well as cutting speed. This diamond blade is a premium grade, which means that it has been especially designed for faster-wet cutting of different types of materials, including granite, ceramic, porcelain, as well as marble tile. The Black Widow blade is equipped with diamond shaped laser cutout, which is uniquely designed to prevent wobbling of the blade while keeping the blade cooler. This, in turn, ensures a longer life span of this saw blade. With this blade’s 7mm rim height, there is an assurance of a longer blade life of this model. At the same time, it also ensures an increased cutting contact, ideal for solid masonry and high-speed cutting. This blade is constructed using thin-rim, premium-grade diamond blade. It is designed for hard masonry and high-speed cutting. It is equipped with a unique designed to keep the blade from wobbling while cutting. The .06 inch thickness of this blade makes it prone to creating imperfect cuts. The WALT DW4725 Diamond saw a blade is a high-performance option for individuals who need a tool that can perform high-quality cutting. It is equipped with a thin kerf that can help in boosting the cutting speed. At the same time, it works in minimizing dust. This model features an ultra-durable, high-performance diamond matrix which provides about 200 times the cutting life compared to standard abrasive blades. This option is ideal for dry cutting applications on a broad range of materials used in masonry, including siding, blocks, and several others. The use of HiPerf MAS Blade in this unit makes it a high-performance option for individuals who need a reliable diamond saw blade for masonry. The blade comes in a size of 4-1/2 inch, which means that it has the capability to perform various cutting tasks on different types of materials. This technology offers 200 times more on the life of traditional abrasives. This means that if you are looking for longevity in the diamond saw blade that you choose; this is an ideal option for you. This very same feature also offers an enhanced removal of the material. The implementation of a thinner kerf in the design of this diamond saw blade works toward increasing the cutting speed and at the same time minimizing dust which could otherwise disturb the cutting process. This model of diamond saw blade is very easy to use. It is backed up by the reputation of the manufacturer. It is designed with a thinner kerf for an enhanced cutting speed. May not work well on cutting tiles. 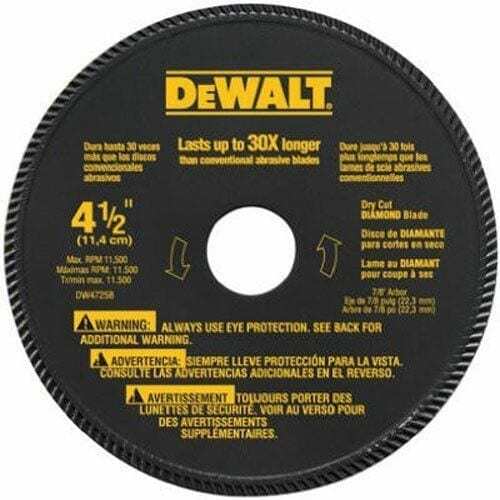 If you are looking for an industrial grade diamond saw blade, the DW4701 model from DEWALT is a good choice to take into consideration. It is designed to perform well in both wet and dry applications. It also offers an extended performance diamond matrix, providing up to 350 times the actual life on most abrasives. Among its standout features include the use of a continuous rim turbo design which offers a maximized use in cutting through different types of materials, including block, brick, and tile. 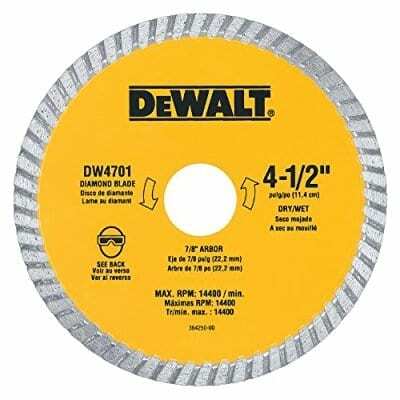 Unlike other diamond saw blades under the same manufacturer, the DW4701 comes with an ongoing rim turbo design. As such, it offers optimal use across different types of materials, including block, brick, and tile. This model also comes with huge diamond segments that are arrayed in cobalt. This makes this saw blade perfect for use in various material cutting applications. This model is a recommended addition to any four up to 4-1/2 inch types of grinders. It also works well with different types of cutting materials, which means that you can expect better value with this saw blade. This diamond saw blade model offers 350 times longer life compared to other abrasives. It is compatible with various cutting materials. The construction of this blade makes it optimal for different cutting tasks. There is a tendency for this saw blade to chip tiles. The Concord Blades CBN045A10CP diamond saw blade model is especially designed for cutting thicker materials, especially marble and granite. It is equipped with a narrow turbo wave design, which means that it has a high-quality wave inner core which comes with zipper style turbo teeth. This features and amazingly smooth and fast cutting, while taking care of the possibility of chipping at the same time. This wave core is not just especially designed, but it also offers other benefits including adding core strength, easy dealing of the debris and controlling wobbles. The use of a 4.5-inch blade size, with 7/8 inch – 5/8 inch arbor makes this blade highly capable of doing super-fast cut while ensuring minimal chipping, even when you are working on dry cutting applications. The compatibility to an angle grinder in this model makes it ideal for the different cutting task. Aside from this, it is also a perfect option for circular saws or wet stone saws. This model is highly compatible with different types of saws, as well as with the various types of cutting materials, including pavers, stone, marble and granite. This diamond saw blade can work well with both dry and wet cutting applications. It minimizes chipping which is common among other models. It can work on different types of saws and cutting materials. While the cuts are amazing, the screws do not mount flush. 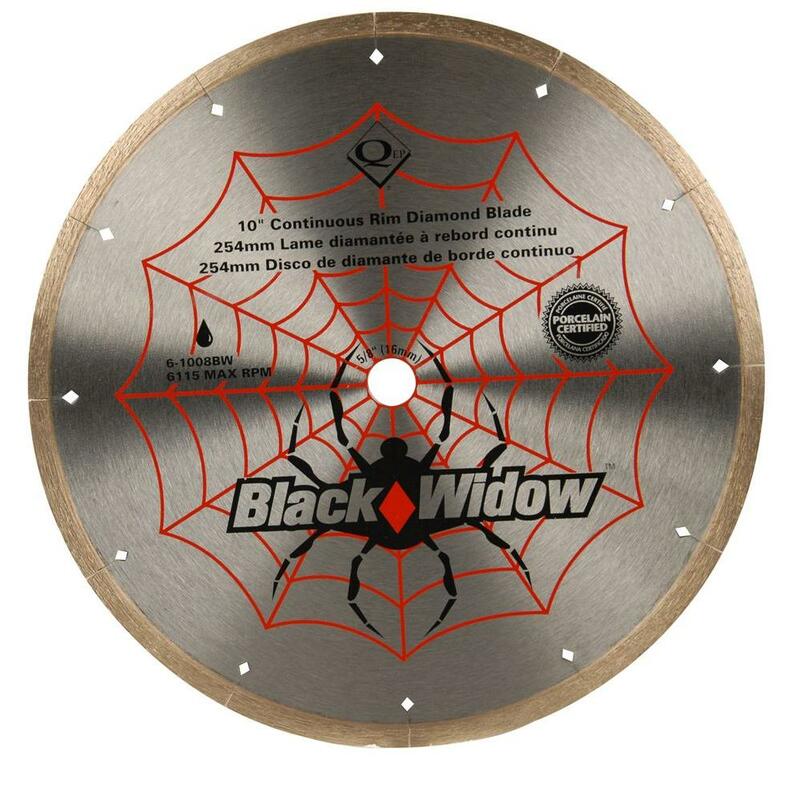 The QEP 6-7008BW Black Widow diamond blade is a thin rim, premium grade option for those who are looking for a tool that can quickly cut through different types of materials, including marble, porcelain, ceramic, slate, granite, and several others. This particular model comes with a 7-inch blade size, designed with specialty blades that are capable of standing out from the rest of the competition, thanks to its cutting speed, thus reducing the overall time typically spent on doing a task. This blade is made of high-quality materials, described as a thin-rim and premium-grade diamond blade. It is designed for wet cutting applications, cutting on different types of materials, including ceramic, porcelain, marble tile and granite. The use of diamond-shaped laser cutouts in this blade prevents wobbling while keeping the blade cooler while performing the task. This feature also contributes toward having a longer life and cutting capacity of the blade. With a 7 mm rim height, this blade is expected to offer an increased cutting contact. It is also ideal for hard masonry as well as high-speed cutting of thick materials, including tile. This diamond blade is designed for cutting different types of materials. It is equipped with a feature that prevents wobbling of the blade. This blade is designed for wet cutting applications. This model may have the tendency to chip the edges of the cut materials. Another customer recommended this tool to any contractor, as well as DIYers. The cuts created are true and straight, eating through different materials in the same way that hot knife cuts through butter easily. For DIYers, using it at first may be challenging, but once users get the hang of it, they will be happy adding this tool to their arsenal. Not all customers are satisfied with the quality of the diamond blade, though. For example, one customer expressed dissatisfaction over the fact that this diamond blade did not come with the standard backing flange, which is available in other models from the same manufacturer. The flange, on the other hand, is available separately. Dremel SM540 diamond blade saw is designed to effectively cut through different types of materials, including the referred residential materials, including metal, wood, tile and plastic. It is equipped with two types of wheels for cutting. One is the traditional flat wheel, and the other is a domed flush cut wheel which is ideal for working on bevel cuts, door jambs, as well as other tight places. QEP 6-8008BW is an 8-inch micro-segmented rim design diamond blade. It comes with a thin-rim design, which makes it ideal for quick wet cutting applications, such as when working on ceramic, porcelain, marble tile and granite. It is also equipped with a highly unique, diamond-shaped laser cutouts which work in preventing wobbling of the blade while keeping the blade cooler and extending its life. Concord Blades SSB140C15CP is ideal for cutting light weight blocks, concrete, field stone, bricks, stone, as well as other materials for masonry. What makes it stand out from the rest is that it can be used for both wet and dry cutting applications. The laser is used in treating both sides of the segment, thus adding strength and life expectancy of the blades. The 12BLADEDM diamond saw blade model from Evolution Power comes in a 12-inch blade size, with the capacity to cut through reinforced concrete, stone, brick, as well as paving material. Most of the reviews coming from actual customers who have used this model are favorable to it, which means that it is an ideal option, especially for those who are dealing with masonry process. The QEP 6-7006GLQ diamond blade model comes with a continuous rim design, which means that it can cut through glass tile. It can be used for both wet and dry applications, with a maximum of 8730 RPM cutting speed at wet cutting tasks. This diamond blade model is designed to provide efficient cuts while ensuring minimal chipping. The AUTOTOOLHOME 4.5” diamond blade is ideal for use on angle grinders. It has the capacity to cut through tasks such as ceramic, concrete, brick stone, tiles, and other materials. It is best used for dry cutting applications, though it can also be used for wet cutting tasks. Regarding speed, it offers a maximum of 13000 RPM, which means that it is powerful enough to complete various tasks. The Rockwell RW9228 VersaCut diamond blade is designed to effectively cut through materials including stone tile, ceramic tile, cement, as well as the backer board. With its #60 grit blade, this model is highly suitable for cutting through thicker materials. As a blade with a 3-3/8 inch diameter size, it is well compatible with the Versacut saws from Rockwell. 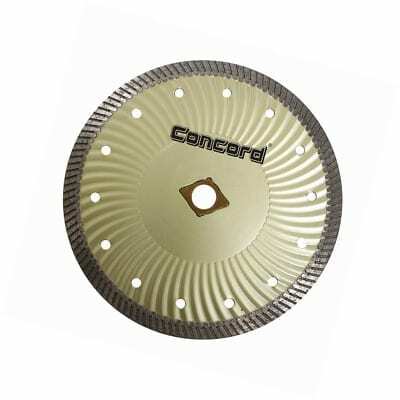 Concord Blades CRS045A10CP comes in a continuous rim design, which allows it to cut through tile blade effectively. This blade is designed for wet cutting applications only. With its 10 mm segment height, this blade easily exceeds the so-called standard height of the usual tile blades. It is perfectly compatible for use on circular saws, angle grinder, wet stone saw as well as a wet tile saw. Bosch DB743S has a continuous rim design for its diamond blade, making it very effective for creating clean cuts with most tile materials. In order to ensure the stability of this model, it features a tensioned steel core. Other features that make it a stand out option is the presence of consistent diamond content, as well as even distribution. Rockwell RW9228 also features a #60 grit diamond blade which can be safely, and effectively used in cutting stone tile, ceramic tile, cement, as well as the backer board. With its 3-3/8 inch diameter size, it is compatible for use together with Rockwell Versacut saws. At this point, you may find yourself in a better position when it comes to making a sound decision for purchasing a diamond blade for your equipment. While there are more than a handful of options presented above, looking into the features of each option will allow you to familiarize them better, seeing whether or not they are compatible with your equipment. The price range may vary, but note that a high-quality diamond blade need not necessarily be expensive. In fact, there are options that come at an affordable price, while making sure that you get what you need regarding cutting.